The Flex Pass is the way to enjoy our Camps! Flex Pass is the way for your child to enjoy Camps at Sports Connection. With the Flex Pass, your child can choose to come to individual days of camp during the year without having to pick the specific days at the time of purchase. The Flex Pass is valid at our Ballantyne, Northlake and Granite Street locations for the Super Terrific Fun Camps, Sports Camps, School Break Camps and Holiday Camps only. One Flex Pass is $300 and allows your camper to come to 6 Days of Camp. The Flex Pass is per camper and is not transferable or refundable and is not able to be prorated. To REGISTER for any Sports Connection Summer Camp, or to just VIEW all the specific dates available for each camp, please click on the Sports Connection Location below you are interested in. You will be connected to our Secured Online System (called DASHOnline) to setup your Camper Information and then select your Camp Dates, Early Drop-Off / Late Pick-Up Dates and Lunch Dates. If you are already a Sports Connection Customer, you can LOG IN with your UserName (Email) and Password. If you are new to Sports Connection, you can easily create an account or connect using Facebook. If you have forgotten your password, simply click "I have forgotten my password", or feel free to call us at 704-583-1444 to reset your password for you. NEW FOR 2019 - Too busy to register online? No problem. We have camp specialist available from 10 am - 7 pm Monday - Friday to assist you in person at our Ballantyne and Northlake locations, or we can register your child over the phone. 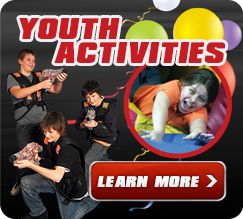 Just call us at 704-583-1444 and ask for a Summer Camp Team Member. The Sports Connection's SUPER TERRIFIC FUN CAMPS & SPORTS CAMPS are offered every day (Monday - Friday) from June 3, 2019 to August 23, 2019. The Sports Connection's SUPER TERRIFIC FUN CAMPS & SPORTS CAMPS are from 8:30 AM until 4:30 PM each day. Campers can be dropped off up to 30 minutes before the start of camp and picked up no later than 30 minutes after the end of camp. Extended Drop-Off starting at 7:00 AM and Extended Pick-Up until 6:00 PM are available each day for an additional $6 per session. We do not offer sibling discounts. Campers attending multiple weeks of camp and are interested in discussing a possible payment plan, can call 704-583-1444 for more details. An Annual Registration Fee is required for all Summer Camps. The Registration Fee is $25 per Camper or $35 per Family. Each camper is responsible for bringing his/her own bag lunch for each day of camp or can sign up for the Sports Connection's optional hot lunch program. The daily hot lunch option includes an Entree, Drink, Chips and a Cookie. The cost is $6 per day (plus tax), or $5 per day (plus tax) if you register and pay online. Campers (or Parents) can select their lunch preference each morning at check in. Daily options are: Cheese Pizza, Pepperoni Pizza, Chicken Nuggets, Hot Dog. The Sports Connection will provide time for snacks and beverages each morning and afternoon for all campers. Beverages and snacks will be available for purchase at the Sports Connection snack bar. Campers are welcome to bring their own snacks and beverages as well. Campers are required to wear sneakers and socks to camp each day. No sandals or heelys. Socks are required to be worn at all times in the inflatable area. The camp counselors are full-time employees of the Sports Connection, Physical Education Instructors, School Teachers and other local Sports Enthusiasts. Our ratio is 8 to 10 campers per counselor. Campers may TRANSFER from one day or week to another, at no charge, provided we are notified (preferably by email) 2 or more days before the start of the original camp date and there is room available in the new camp date. Changes made less than 2 days before the start of the original camp date will result in a transfer fee of $10 per day. CANCELLATION of the camp at anytime, will result in a $10 fee per day. The remaining balance will be issued as a Sports Connection CREDIT to be used for another camp or program at Sports Connection, or the balance can be put on a Sports Connection GIFT CARD to be used at any time in the future. There will be no transfers or credits allowed without at least a 4 hour notification before the start of the first day of camp.